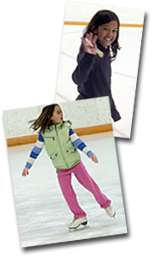 Rules, Regulations and Policies of Skate Canada. was Dr. John Brown, a local dentist. Many changes have taken place since the club was formed. together from several different CD's. The Carnival has always been a large part of the club's history. were brought in for the audience to enjoy. international awards to the club and added excitement to the Carnivals. Many of the club's skaters have gone on to be Provincial and Canadian contenders. Also, the club has produced many individual skating professionals. the Delhi Skating Club has much to be proud of.